Heat the oil in a large saucepan over medium heat. Add the coriander and cumin and cook, stirring, for 30 seconds or until fragrant. Add the onion and garlic and cook for 4–6 minutes or until softened. Add the cauliflower, split peas, cashews, salt and pepper and stock. Increase the heat to high and bring to the boil. Cover with a lid, reduce the heat to medium and cook for 30 minutes or until the split peas are tender. Add the chicken, cover and cook for 12 minutes or until cooked through. Remove the soup from the heat, cover and allow to stand for 5 minutes. Remove the chicken, set aside to cool slightly and shred. Using a hand-held stick blender, blend the soup until smooth. To make the spiced seeds, heat the oil in a small non-stick frying pan over high heat. Add the garlic, pumpkin seeds, sunflower seeds and sesame seeds and cook for 1 minute or until golden. Add the coriander and cumin and stir to combine. 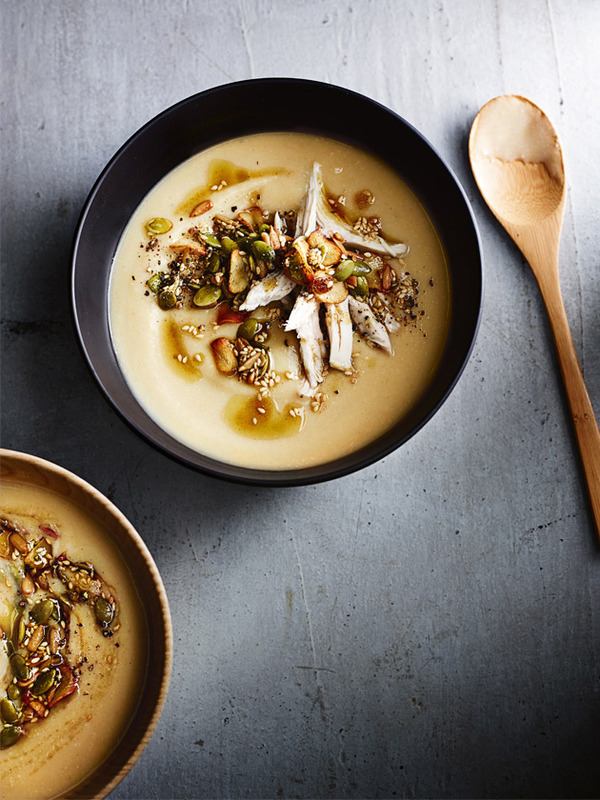 Divide the soup between bowls and top with the shredded chicken and spiced seeds to serve. Serves 4.